It's time again for a Cupcake Inspirations challenge! This time we are sponsored by Bugaboo Digi Stamps. 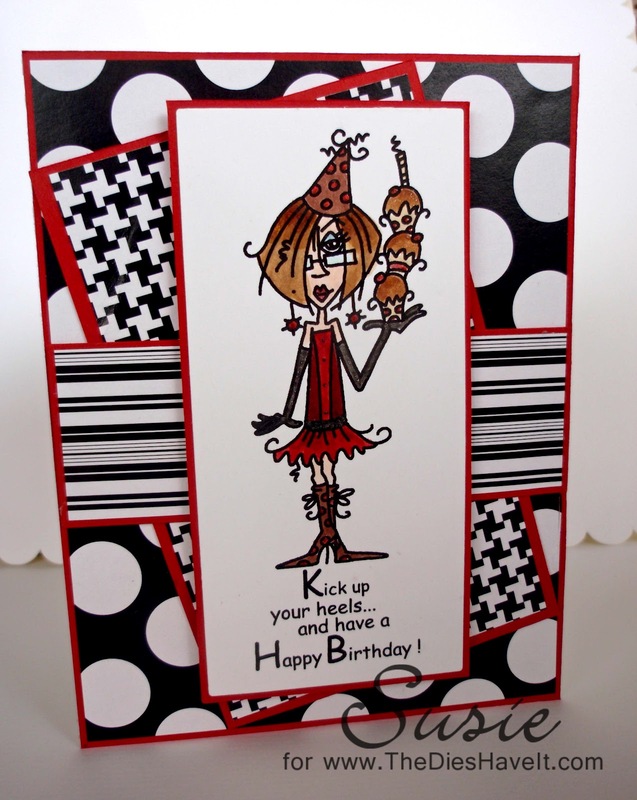 If you want some fun and sassy digital stamps, Bugaboo is the place to look. They won't disappoint. The papers for this card were hidden deep in my stash. I think I bought them at Michaels years ago. But I love the combo for this card. Also fun and sassy. Both the image and the sentiment are from Bugaboo. I can't wait to get this one in the mail to one of my February birthday friends. Be sure to check out what all the designers have for you and then submit your own card. You know you want to. Just head right on over to the Cupcake Inspirations site. Hi Susie, well this card did make me smile and I love it the colours are super. 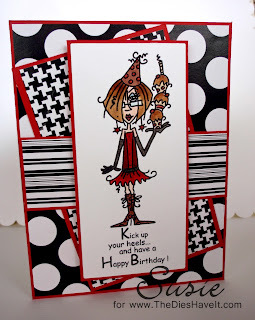 Definitely a fun and sassy card! The papers are perfect. Superb - love the huge polka dots and fabulous hounds tooth! Absolutely adorable!! What a fun image Susie! I always admire your work so much!!! what a great card! it definitely goes along perfectly with that inspirational cupcake image! thanks for sharing!